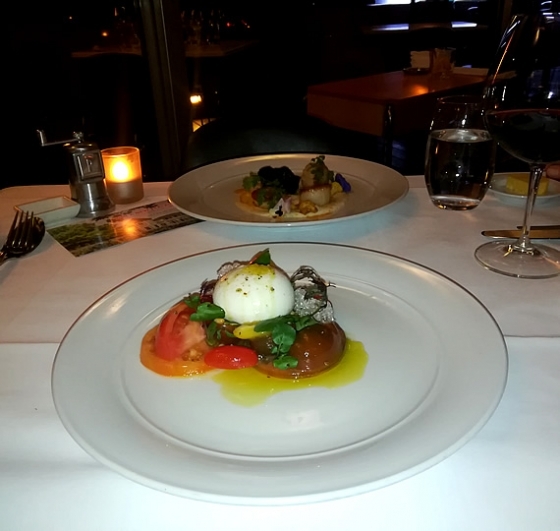 Catalina in Rose Bay would have to be one of the finest of dining establishments there is in Sydney. This celebrity haunt is located right by the ocean providing some truly stunning views across the harbour. With its upmarket seafood dishes and open veranda bar with waterfront views, it’s no surprise that you’ll find a who’s who of Sydney here on any given day. While we didn’t arrive by seaplane (unfortunately), we recently sat down at this picturesque restaurant to sample some of its delicious food while blending in with the flying boat enthusiasts. While the venue’s interior is very white and minimalist, it makes perfect sense when surrounded by such glorious views. But what about the food? If you’re a seafood lover, you’ll be in heaven with the variety and quality of food on offer. Starters include freshly shucked Sydney Rock Oysters sourced from the best growers on the NSW coast, Pan Fried Mooloolaba King Prawns, House-Smoked Mount Cook Salmon, Grilled Western Australian Marron and Pan Seared Sea Scallops – the latter of which would be our number one pick. With spanner crab, squid ink tortellini, cauliflower puree and bottarga, this one is perfection on a plate. The entree options don’t end there with Beef Cheek & Wild Mushroom Tartlet, Citrus Buffalo Ricotta, and Catalina’s version of the caprese salad also available. We love a good caprese salad and the one on offer here is slightly different to the norm with the addition of pepitas and pine nuts. It really gives the dish that extra bit of crunch and flavour when combined with the burrata, heirloom and organic tomatoes, mustard leaves and white balsamic vinegar. A real winner! The entree’s are nice and light ensuring you won’t be too full for the hearty mains that are to follow. Options include the Mt Saikou Salmon, Crispy Skin Cone Bay Barramundi, House Made Parsley Spaghettini, Roast Chicken, Junee Lamb Rack, Premium Beef Tenderloin, Roasted Suckling Pig, and a number of vegetarian alternatives. But the Glacier 51 Toothfish is our pick of the bunch with dutch carrots, caramelised daikon, enoki, shiitake mushroom dumplings and consomme. It’s a real high quality feast worthy of its $52 price tag. One of the specials of the night on our visit was the Pan Fried Snapper. The garlic potato mash and lemon caper butter really complements its fresh flavour making this one another must-try! If you’re sticking around for dessert, the Valrhona Dark Chocolate Mousse with jaffa ganache and marmalade ice cream is simply delectable while the Chocolate Fondant with salted cashews and creme fraiche is also one you must experience. Catalina is a truly classy restaurant. Some might find the prices a little eye-watering but that’s to be expected at such an upmarket establishment. Come with a full wallet, enjoy the views, and dig in to some delicious food.